اکبرزاده, نفیسه, معهود, مجید, حمزه لو, حسین. (777). رابطه کاهندگی بیشینه شتاب طیفی افقی جنبش زمین برای شمال غرب ایران. مجله ژئوفیزیک ایران, 9(3), 76-90. نفیسه اکبرزاده; مجید معهود; حسین حمزه لو. "رابطه کاهندگی بیشینه شتاب طیفی افقی جنبش زمین برای شمال غرب ایران". مجله ژئوفیزیک ایران, 9, 3, 777, 76-90. اکبرزاده, نفیسه, معهود, مجید, حمزه لو, حسین. (777). 'رابطه کاهندگی بیشینه شتاب طیفی افقی جنبش زمین برای شمال غرب ایران', مجله ژئوفیزیک ایران, 9(3), pp. 76-90. اکبرزاده, نفیسه, معهود, مجید, حمزه لو, حسین. رابطه کاهندگی بیشینه شتاب طیفی افقی جنبش زمین برای شمال غرب ایران. 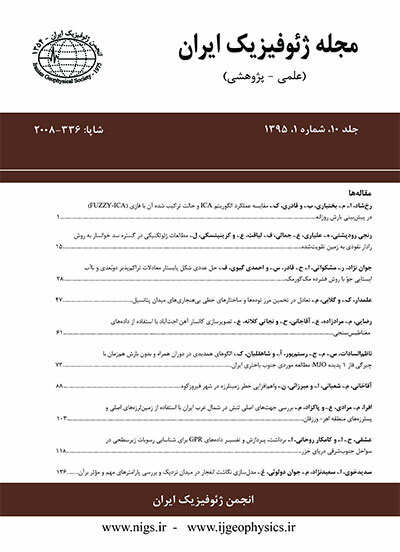 مجله ژئوفیزیک ایران, 777; 9(3): 76-90. در این تحقیق، برای اولین‌بار رابطه کاهندگی طیفی نظری-تجربی مناسب و کاربردی برای منطقه آذربایجان شرقی-شمال غرب ایران عرضه شده است. به این منظور از 51 شتاب‌نگاشت ثبت شده روی شرایط ساختگاه سنگی در منطقه شمال غرب ایران که در ایستگاه‌های شتاب‌نگاری مرکز تحقیقات ساختمان و مسکن از سال 1976 تا 7 نوامبر 2012 به ثبت رسیده است، استفاده شد. به‌منظور تکمیل بانک داده‌ها برای بزرگا و فاصله‌هایی که اطلاعاتی در مورد آنها وجود ندارد، 62 ایستگاه‌ فرضی به موازات و عمود بر راستای دو گسل فعال منطقه (گسل شمال تبریز و گسل مسبب زمین‌لرزه اول اهر-ورزقان) قرار گرفت و با استفاده از شبیه‌سازی به روش تصادفی گسل محدود و با درنظر گرفتن پارامترهای زلزله‌شناسی منطقه، تعداد 1240 شتاب‌نگاشت مصنوعی با بازه بزرگای و گام بزرگای برای گسل شمال تبریز و و گام بزرگای برای گسل مسبب زمین‌لرزه اول اهر-ورزقان و فاصله تا تصویر سطحی گسل (rjbکمتر از 150 کیلومتر ایجاد شد. با استفاده از روش برازش بیشترین احتمال جوینر و بور (1993) روی 1291 رویداد ثبت شده، ضرایب رابطه کاهندگی نظری-تجربی در 14 تناوب متفاوت، برای منطقه آذربایجان شرقی-شمال غرب ایران عرضه شد. درنهایت به‌منظور حصول اطمینان از دقت رابطه پیشنهادی، مدل به‌دست آمده با روابط جهانی و روابط عرضه شده برای ایران مقایسه شد که هم‌خوانی خوبی با این روابط نشان می‌دهد. The region of northwestern Iran is exceptional within the Arabian-Eurasian continental collision zone. The tectonics is dominated by the NW-SE striking right-lateral North Tabriz Fault (NTF) and regional seismicity (historical and modern one) concentrates[u1]Â . The NTFis a major seismogenic fault in NW Iran. The last damaging earthquakes on this fault occurred in 1721, rupturing the southeastern fault segment, and in 1780, rupturing the northwestern one. The understanding of the seismic behavior of this fault is critical for assessing the hazard in Tabriz, one of the major cities of Iran; the city suffered major damage in both the 1721 and 1780 events. The north of the NTF seismicity is rare, and almost nothing has been revealed about activity of the structures until now. Â Â Â On 11th of August 2012, the region was surprisingly struck by a shallow Mw 6.5 earthquake with a pure right-lateral strike-slip character only about 50 km to the north of the NTF. An east-west striking surface rupture of about 20 km length was observed in the field by Geological Survey of Iran. Only 11 minutes later and about 6 km further to NW, a second shallow event with Mw 6.2 occurred. It showed an NE-SW oriented oblique thrust mechanism. This earthquake sequence provided an opportunity to understand better the processes of active deformations and their causes in NW Iran. Â Â Â Ground-motion relations describing the expected amplitudes of this motion as functions of the magnitude and distance are key components of seismic hazard analyses. Ground-motion (attenuation) relations are used to estimate strong ground motion for many engineering and seismological applications. Where strong motion recordings are abundant, these relations are developed empirically from strong-motion recordings. Where recordings are limited, they are often developed from seismological models using stochastic and theoretical methods. Â Â Â The stochastic model is a widely-used tool to simulate acceleration time series and develop ground motion relations (Hanks and McGuire, 1981; Boore, 1983; Boore and Atkinson, 1987; Atkinson and Boore, 1995 and 1997; Atkinson and Silva, 1997 and 2000). The stochastic method begins with the specification of the Fourier spectrum of the ground motion as a function of magnitude and distance. The acceleration spectrum is modeled by a spectrum with Ï2 shape, where Ï is the angular frequency (Aki, 1967; Brune, 1970; Boore 1983). Finite fault modeling has been an important tool for the prediction of ground motion near the epicenters of large earthquakes (Hartzel, 1978; Irikura, 1983; Joyner and Boore, 1986; Heaton and Hartzel, 1986; Somerville et al., 1991; Tumarkin and Archuleta, 1994; Zeng et al., 1994; Beresnev and Atkinson, 1998a). One of the most useful methods to simulate ground motion for a large earthquake is based on the simulation of some small earthquakes as subfaults that comprise a big fault. A large fault is divided into N subfaults, and each subfault is considered as a small point source (introduced by Hartzel, 1978). Â Â Â In this study, the first region-specific ground motion relations were developed for seismic hazard analysis of NW Iran. The attenuation relation for the horizontal acceleration response spectrum in a period of 0-4 s, with a magnitude range of Mw=5 to 7.7 and distances up to 150 km were established. We used 51 waveforms recorded on a rock site in the NW Iran. Due to the paucity of the data at small distances and large magnitudes, we applied the stochastic method to simulate waveforms for different magnitudes and distances. To overcome the incompleteness of the data set, we simulated 1240 acceleration time series for magnitudes from M5.0 to M7.7 and magnitude steps of 0.2 units for the North Tabriz fault and M5.0 to 6.7 and magnitude steps of 0.5 units for the Ahar fault. The relations were derived by a maximum likelihood regression algorithm from Joyner and Boore (1993) on a set of 1240 simulated strong-motion records and 51 observed ground motions recorded on the rock site in this region. The theoretical-empirical ground motion relation for NW Iran was compared to the ground motion relations for the other regions and had a good agreement with them especially with Akkar and Bommer relations for Europe, the Mediterranean Region and the Middle East. The present results will be useful in estimating strong ground motion parameters and in the earthquake resistant designs in this region. حمزه‌لو، ح.، فرزانگان، ا.، میرزایی علویچه، ح.،1389، سازوکار زمین‌لرزه 10 آذر 1386 تبریز با استفاده از داده‌های شتاب‌نگاری،فصلنامه علمی-پژوهشی علوم زمین، شماره75. سیاهکالی مرادی، ع.، تاتار، م.، هاتسفلد، د.، پل،آ.، 1387، مطالعه ساختار سرعتی پوسته و سازوکار گسلش در زون گسلی امتداد لغز تبریز. فصلنامه علمی-پژوهشی علوم زمین، شماره70. شریفی، م.، بایرام نژاد، ا.، شمالی، ظ.ح.،1391، تعیین ضریب میرایی تجربی برای شمال غرب ایران با استفاده از شتاب‌نگاشتها. پانزدهمین کنفرانس ژئوفیزیک ایران، صفحه97-100. گزارش مقدماتی زمین‌لرزه اهر-ورزقان، سایت سازمان زمین‌شناسی و اکتشافات معدنی کشور. نظام الاسلامی، ح.، 1382، تعیین فاکتور کیفیت برای پیرامون تبریز،پایان نامه کارشناسی ارشد، مؤسسه ژئوفیزیک دانشگاه تهران. Akkar,S., Bommer, J.J., 2009. Empirical Equations for the Prediction of PGA, PGV and Spectral Accelerations in Europe, the Mediterranean Region and the Middle East. Seis. Res..Letters. Ambraseys, N.N., &Melville, C.P., 1982. A history of Persian earthquakes, Cambridge University Press, UK, 219pp. Anderson,J. and Hough, S.E.,1984. A model for the shape of the Fourier amplitude spectrum of acceleration at high frequencies, Bull.Seism. Soc. Am.74,1969-1993. Beresnev,I. and Atkinson, G., 2002. Source parameters of earthquakes in eastern and western North America based on finite-fault modeling, Bull. Seism. Soc.AM. 92,695-710. Boore, D. M., and W. B. Joyner, 1997. Site amplification for generic rock sites, Bull. Seism. Soc. Am. 87, 327–341. Boore, D. M., 2003.Simulation of Ground Motion Using the Stochastic Method, Pure Appl.Geophys., 160, 635-676. Boore, D. M., and Atkinson, G.M. 2008. “Ground-motion Prediction equations for the average horizontal component of PGA, PGV, and 5% damped PSA at spectral Perios between 0.01 s and 10.0 s”, Earthquake Spectra, Vol. 24, pp.99-138. Campbell, K.W., and Y. Bozorgnia, 2003. Updated Near-Source Ground-Motion (Attenuation) Relations for the Horizontal and Vertical Components of Peak Ground Acceleration and Acceleration Response Spectra, Bull. Seism. Soc. Am., 93 (1), 314-331. Campbell, K.W., 1985. Strong motion attenuation relations: a ten-year perspective, Earthquake Spectra, 1(4), 759–804. Douglas, J., 2003. Earthquake ground motion estimation using strong motion records: a review of equations for the estimation of peak ground acceleration and response spectral ordinates, Earth-Science Reviews, 61, 43-104. Farahbod,A.M., Alahyarkhani,M.,2003,Attenuation and Propagation characteristics of Seismic Waves in Iran. Fourth International Conference of Earthquake Engineering and Seismology. Fukushima, Y., 2003. Attenuation Relation for West Eurasia Determined with Recent Near- Fault Records from California, Japan and Turkey, J. Earth. Eng., 7(4), 573-598. Hamzehloo, H., Mahood, M., 2012, Ground-Motion Attenuation Relationship for East Central Iran, Bulletin of the Seismological Society of America December 2012vol:102, No6, pp:2677-2684. Idriss, I. M., 2007. Empirical Model for Estimating the Average Horizontal Values of Pseudo-Absolute Spectral Accelerations Generated by Crustal Earthquakes; Vol. 1, Sites with Vs30=450 to 900 m/s, Interim Report Issued for USGS Review. Joyner, W.B. and Boore, D.M., 1993. Methods for regression analysis of strong-motion data, Bull. Seism. Soc. Am., 83(2), 469-487. Kanamori, H., and Anderson, D. L., 1975. Theoretical basis of some empirical relations in seismology, Bull. Seism. Soc. Am., 65, 1073-1095. Motazedian, D. and Atkinson, G.M. 2005, Stochastic Finite-Fault Modeling Based on a Dynamic Corner Frequency,Bull. Seism. Soc.Am., 95,995-1010. Motazedian, D. and Atkinson, G.M. 2004, Ground-motion Relations for Puerto Rico, For GSA Special Issue. Sinaiean, F. 2006. “A Study of the Strong Ground Motions in Iran”, Ph.D. Thesis, International Institute of Earthquake Engineering and Seismology, Tehran, Iran. Wells, D. L. and K. J., Coppersmith, 1994. New Empirical Relationships among Magnitude, Rupture Length, Rupture Width, Rupture Area, and Surface Displacement, Bull. Seism. Soc. Am., 84, 974-1002. Zafarani, H.,Mousavi, M., Noorzad, As., and Ansari, A. (2008). “Calibration of the specific barrier model to Iranian plateau earthquakes and development of physically based attenuation relationships for Iran”, Jurnal of Soil dynamics and Earthquake Engineering. 28, pp. 550-576. Zare, M., 1999. Contribution a l’etude des mouvements forts en Iran: du Catalogue Aux Lois D’ Attenuation, Ph.D. Thesis, University Joseph Fourier, Geronoble, France.